RiverBus/Thames Line operated commuter services on the River Thames between 1988 and 1993. The raison d'être of RiverBus was that it would serve two newly developed riverside areas, Chelsea Harbour and Canary Wharf, and the piers in between, carrying residents and business people who would be prepared to pay a higher price than for a journey by tube or bus. 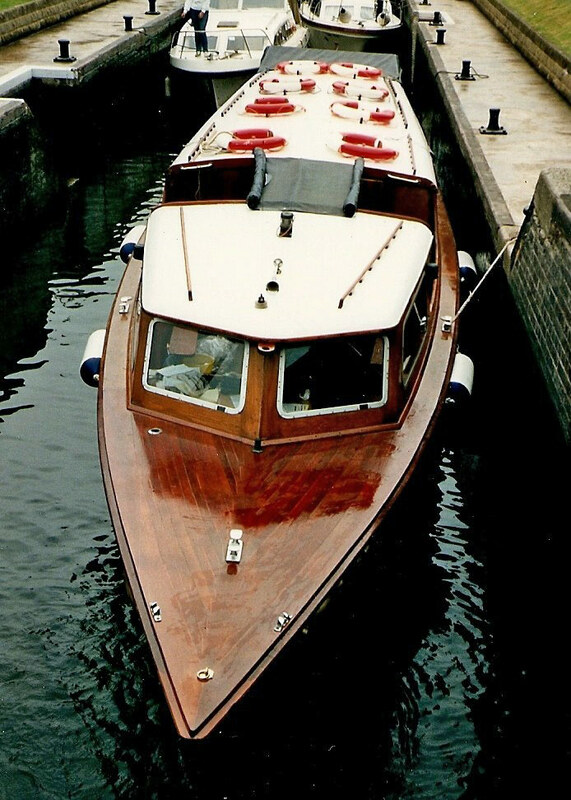 The boats were relatively small, with 62 seats, and built to high internal standards of comfort. Staffing was relatively generous to keep customer service standards high. Demand for the service would grow as firms moved into Canary Wharf. This was the concept which attracted a Business Expansion Scheme grant in 1988 and the service, named Thames Line, was launched. From the start, Thames Line was viewed with suspicion by the established operators and users on the River running tourist services and there were complaints about wash damaging other craft and creating problems for rowers and others, which meant they had to slow down. The catamarans had problems particularly with rubbish floating in the Thames damaging their propulsion equipment, and damage to the hulls from frequent docking. Already by the end of 1988 Tharnesline was experiencing financial difficulties. The services were carrying around 5000 people per day, compared to the projected 20,000. 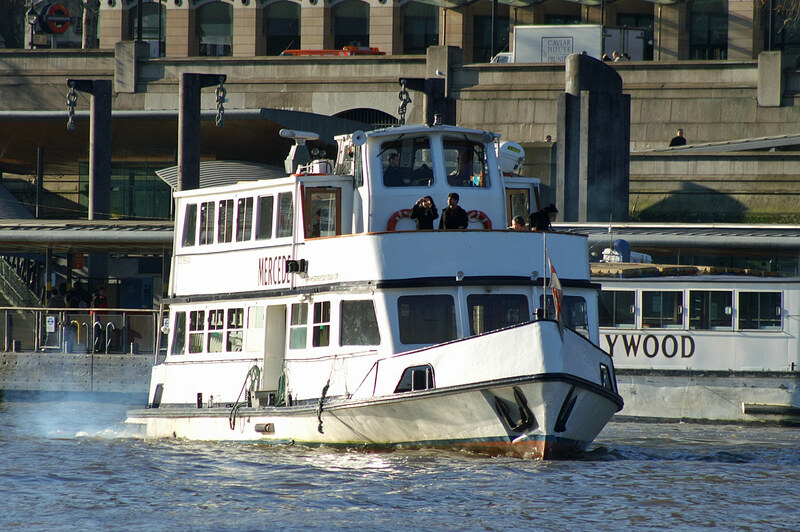 Rescue came from the RiverBus Partnership, a consortium of developers including P&O's property arm and Olympia & York, who saw that the RiverBus service was an asset to Chelsea Harbour and Canary Wharf, in marketing terms as well as for practical reasons. Docklands was still perceived as difficult to get to, with a limited service on the initial DLR (no underground connection at Bank at this time) and with the Docklands highways still under construction. 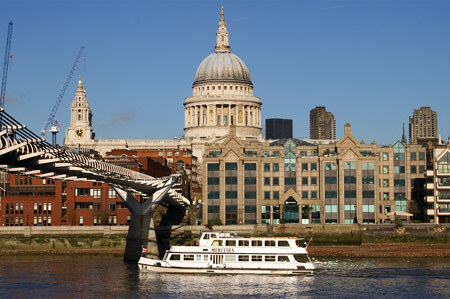 RiverBus could also serve as a link between the mainline stations at Charing Cross, Waterloo and London Bridge and the new developments on the Isle of Dogs. Funding from five developers and a grant of £500,000 from the Department of Transport and Department of Environment underpinned the new RiverBus service operation for the next four years. London City Airport also became a sponsor, and the airport service became popular with incoming airlines. 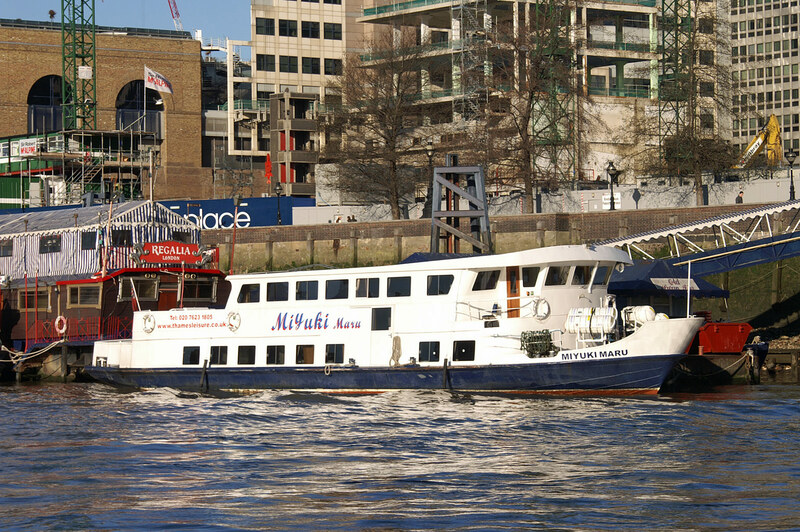 RiverBus increasingly attracted tourists and services started from St Katharine Docks and Greenwich, but in spite of a dramatic growth in passenger numbers to nearly three quarters of a million by 1992, RiverBus still depended on a substantial subsidy from Olympia & York who consciously promoted it as a service for the Canary Wharf commuters. When Olympia & York went into administration in 1992, the banks provided funds on a month by month basis with increasing reluctance. 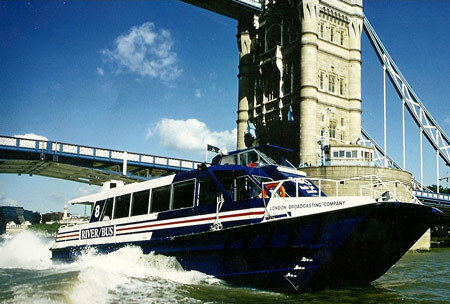 RiverBus had to seek additional funders during 1992 and contributions were received from local government, the private sector and individual benefactors including a new supporter, Parkview International. When the final funding crisis occurred in July and August 1993 the immediate reasons were a shortfall in projected off-peak passenger demand and higher costs than budgeted for in the business plan. 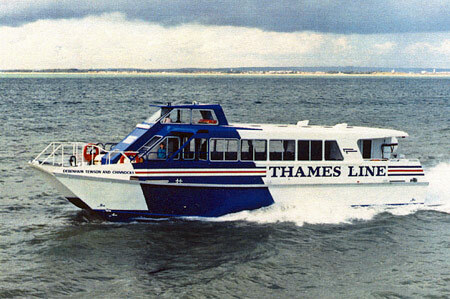 RiverBus went into receivership in August 1993. There are many views about why the service could not survive, but there are some fundamental problems in the way of running a commercially viable passenger service in London in the 1990s. London has a highly developed bus, rail and tube network which is subsidised and offers joint ticketing and the Travelcard facility. RiverBus management attempted to secure inclusion in the Travelcard scheme and through-ticketing arrangements. This would only be financially viable for the service if it charged a premium to passengers on top of the Travelcard Scheme, but would have had the advantage of convenience and flexibility. In the event, London Transport was advised that the RiverBus could not be invited to participate since it would involve public sector grant for LT being passed onto the RiverBus which was a private sector commercial operation. The result was that the journey between Waterloo and Canary Wharf was £2.80 by RiverBus and £1.20 by bus and rail. This made it more difficult for RiverBus to sustain or increase its commuter traffic or attract off-peak business users, particularly when there were steady improvements to the services on the Docklands Light Railway and the Docklands highways opened in May 1993. 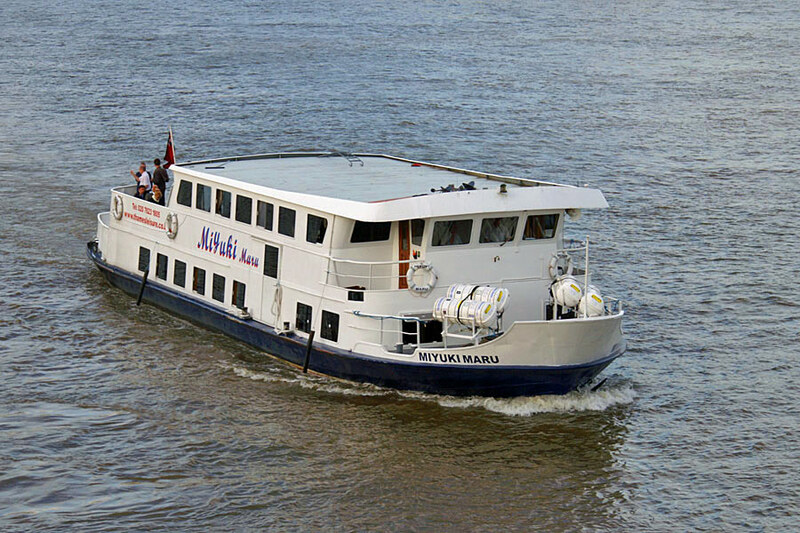 The size both of the boats and of the fleet was insufficient for RiverBus to generate enough income to offset its overheads. In the absence of public or private sector funders to inject the substantial capital investment necessary to restructure its fleet, RiverBus could not build itself into a position from which it could approach profitability. Other adverse factors included a failure to drive costs (especially manning costs) down fast enough, and the inability to utilise Westminster Pier - a factor critical to building market share in the off-peak tourist trade. Other difficulties included the problem of generating sufficient demand at any pier throughout the day, the fact that demand from tourists is seasonal and weather-related, and the problem of providing services sufficiently frequent to be attractive with a small fleet. In conclusion it was hard for a commercial operation to compete in an uncertain market with subsidised public transport without its own subsidy from the developers of Canary Wharf. In February 1994 the fleet of eight catamarans which provided the RiverBus service were sold by the liquidators to the Siam Development and Holding Company of Bangkok for tourist' use in that city. They were later sold to a Hotel in Thailand .The three newer boats reverted to the ownership of P&O. They were then sold onto Serco Denholm in Plymouth and since 1999 & 2001 were bought and currently operate with Thames Clippers having been renamed Storm, Star and Sky Clipper. Thames Line and RiverBus Services by Ian Boyle (based on reports in Cruising Monthly). It was announced in early 1987 that a £270,000 contract had been placed with Aluminium Shipbuilders of Portchester. The first Thames Line vessel was built to a design by Incat (International Catamarans of Tasmania) and would carry 51 passengers at 25 knots. It was also announced that a second design, the Airmaran from Cougar Marine of Hamble, would be ordered if funds permitted, but this did not occur. 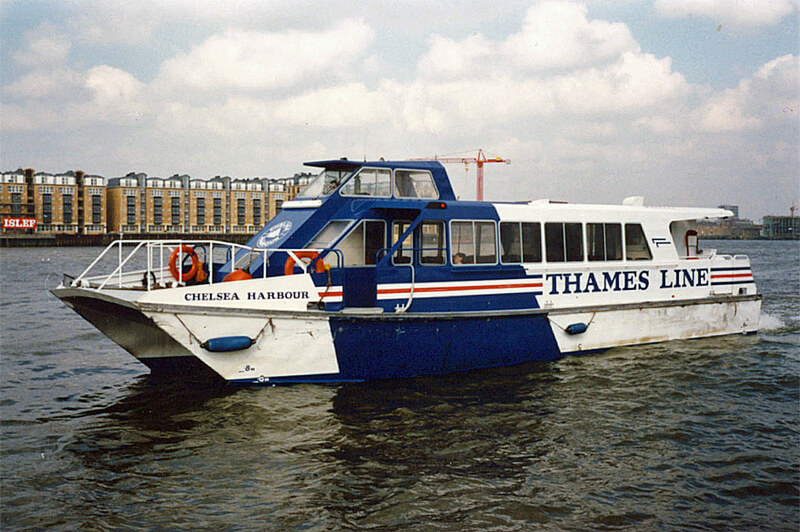 The Incat was delivered in July 1987 and entered service with Thames Line on Monday 7th September between central London and the Isle of Dogs on a 'charter' service for the Daily Telegraph which had moved its offices to the Isle of Dogs. She was named Daily Telegraph (1) following sponsorship by the newspaper, and carried a largely white livery. 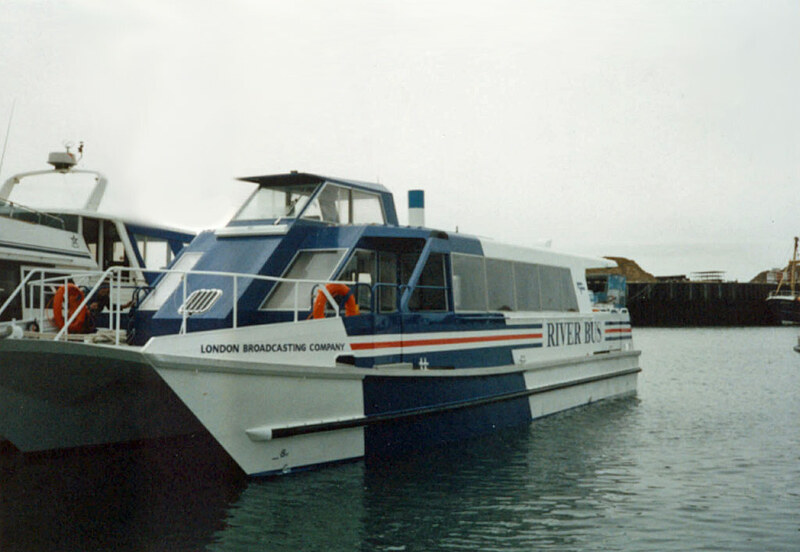 Five further modified craft were ordered (later increased to seven), to be built by Aluminium Shipbuilders, but fitted out by British Hovercraft at St Helens, with plans to operate a full service by mid-1988. In March 1988, Daily Telegraph (1) had been joined by a small monohull fast craft named Max, joined later by another small vessel Perry. Daily Telegraph (1) was renamed Le Premier during the summer, her original name being re-used on the fourth vessel in the series. The second Incat delivered was Barclays Bank, finished in a red, white and blue livery. More extensive Thames Line public services commenced on 9th May 1988 with an hourly service from Charing Cross to London City Airport inaugurated by the third delivery London Docklands. 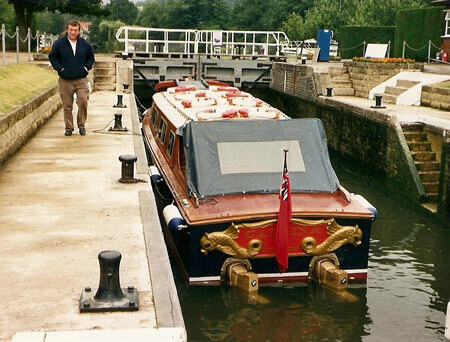 This was to be largely the preserve of the initial boat Le Premier (ex-Daily Telegraph (1)). 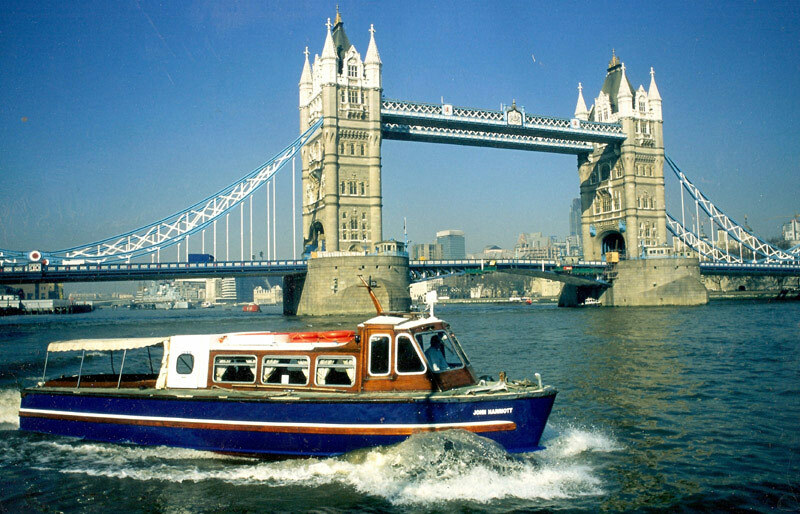 The core service was a 15 min interval between Charing Cross and West India Pier via Festival, Swan Lane, London Bridge and Cherry Garden Piers. The Telegraph charter service ceased when the public service started. In practice, the 15min frequency was not achievable, with reports of passengers having to wait for up to an hour for a service. 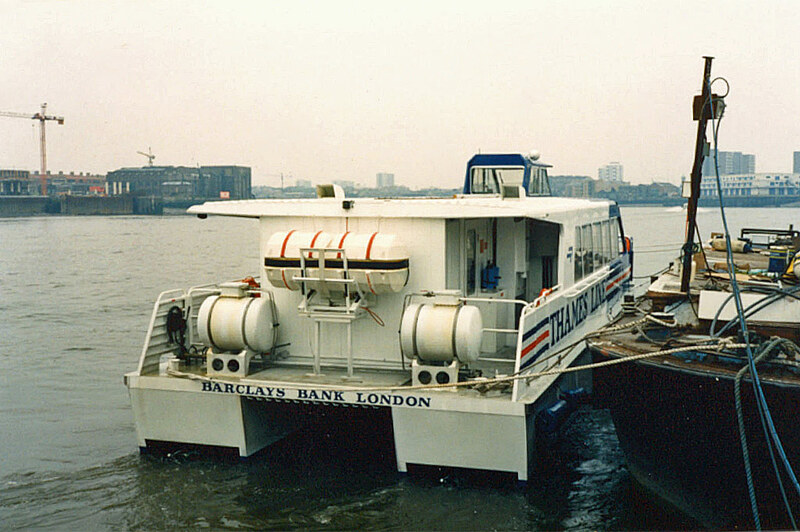 The small vessels Max and Perry would be drafted in to maintain services, for example on 15th June when they worked with Daily Telegraph (2), London Docklands and Barclays Bank, whilst Le Premier ran the Airport shuttle. Max and Perry were reported running with just one crew member, causing delays at piers as the skipper had to attend to ropes, only for the vessel to drift away from the pier before he could secure them. The weekend service was soon reduced from 15 minute to 30 minute frequency. 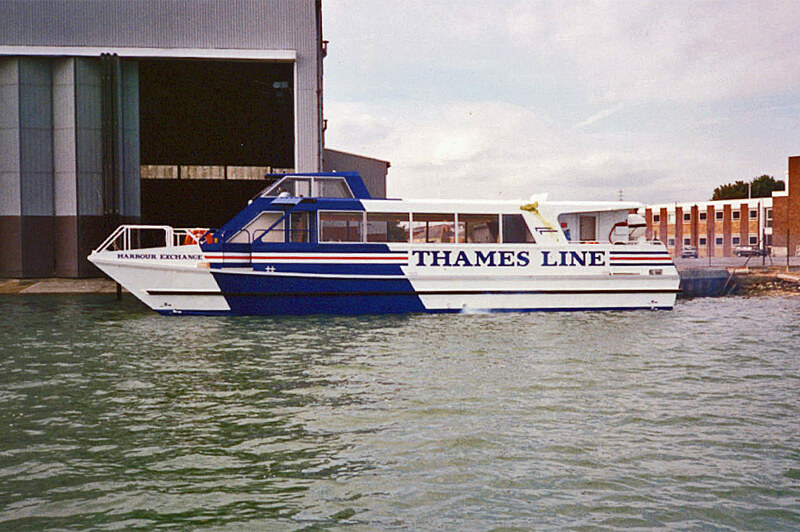 Delayed deliveries meant that a full peak Thames Line service did not start until 1st September 1988, at which point six of the eight boats were in service. On 5th September, Debenham Tewson & Chinnocks, only four weeks old, had to be taken out of service due to an 18 inch crack in the hull. Other boats were found to have similar problems. Barclays Bank was also out of service at this time with propulsion system faults. The Catrina of Catamaran Cruisers was chartered for evening services. When Debenham Tewson & Chinnocks returned to service, a frequency of 15 mins at peak, and 30 minutes off-peak was introduced on the 26th September 1988. Seventh vessel Harbour Exchange entered Thames Line service in mid-October. From December 5th 1989, the peak service frequency was reduced to 20 minutes and weekend services were suspended temporarily, as Thames Line struggled to maintain services with winter overhauls and continuing problems with the vessels in service. The eighth vessel London Broadcasting Company did not arrive until spring of 1989. The 20 minute peak and 30 minute off-peak frequency continued throughout 1989, with winter weekend services initially maintained. They were ceased (again) from 23rd December. 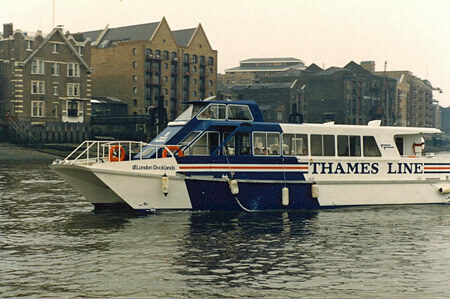 Cruising Monthly reported that the Thames Line service was being marketed as RiverBus by November 1989. 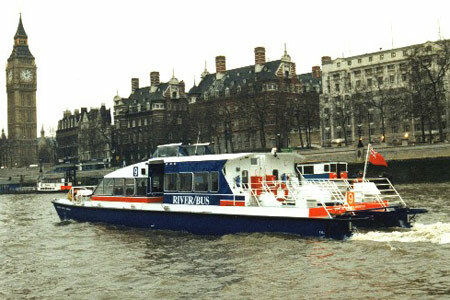 From 15th January 1990, RiverBus services were substantially revised with a 20 minute service all day between Charing Cross and Greenwich calling at Festival, Swan Lane, London Bridge City and West India Piers. 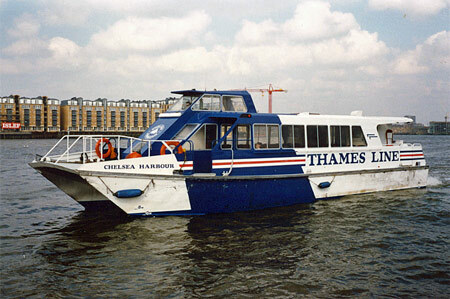 The ex-police launch John Harriot was chartered to maintain a shuttle service between Swan Lane and Chelsea Harbour. This service pattern was maintained until the summer, apart from a short period when John Harriot was off service and was replaced by either one of the catamarans or the chartered The King. The fleet were allocated numbers 1 to 8 which were applied to the boats. The King became number 9, and John Harriot was number 10. Numbers 11-13 were reserved at this time for the new catamarans. 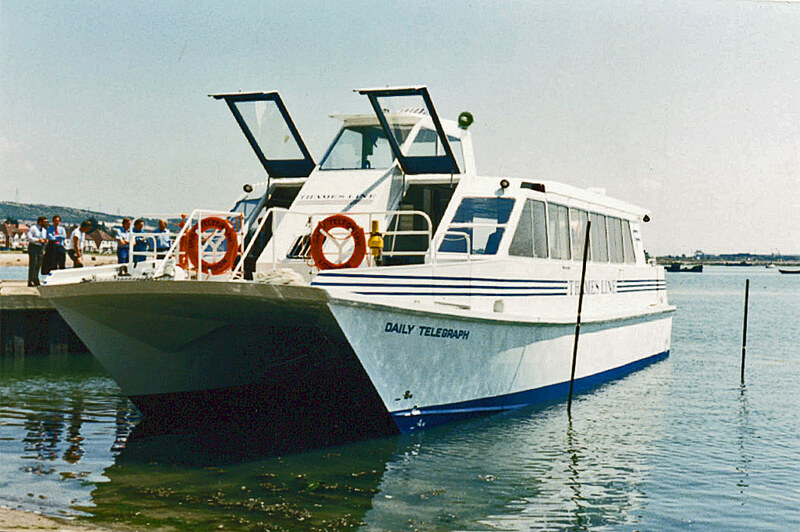 Three additional catamarans were ordered by RiverBus late in 1990 for delivery in autumn 1991. From 1st November 1990, the Chelsea shuttle was revised with most journeys terminating at Charing Cross rather than Swan Lane. On November 2nd, The King again covered for John Harriot which was undergoing engine repairs. 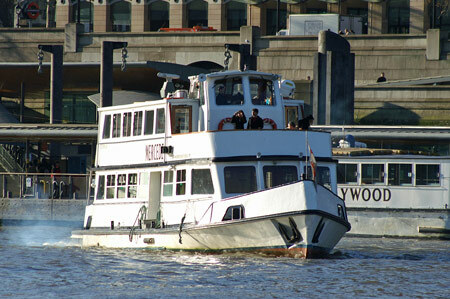 On the same day, the small catamaran South Quay was also in service on the Charing Cross to London City Airport shuttle. 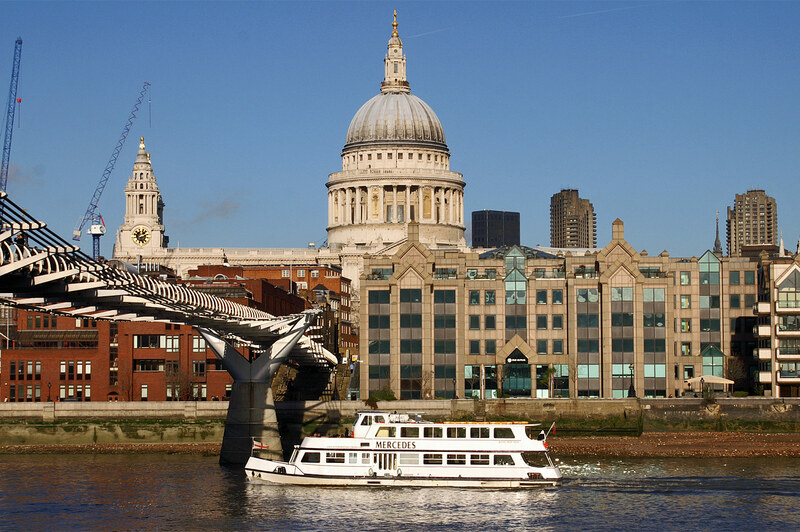 RiverBus services were revised again from 2nd April 1991, with a core 20 minute frequency service between Charing Cross and London City Airport. Traffic was announced as being 60% above that of the previous year. The King continued to appear on the Chelsea shuttle occasionally, reportedly making good time on 22nd February 1991. Further reported dates were June 3rd and October 1st. John Harriot continued to run the shuttle normally, being repainted in blue (from white) to match the catamarans. Weekend services resumed again with a 30 minute frequency on 13th July, along with reports that at busy times both The King and John Harriot operated the Chelsea shuttle. A new pier at Canary Wharf opened on July 23rd 1991. Additional conventional boats chartered for the core service were Miyuki Maru and Mercedes, being allocated RiverBus numbers 15 and 14 respectively, which they carried during their charters. 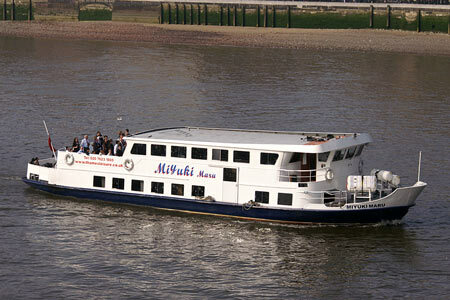 Miyuki Maru soon lost her number and was replaced by Suerita which became fleet number 16. 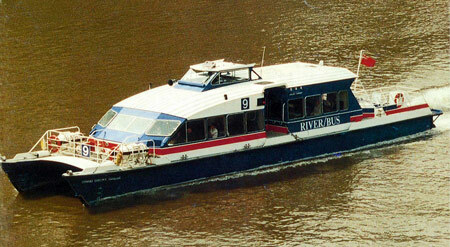 However, by February 10th 1992, none of the conventional boats chartered by RiverBus retained any signs or numbers. All services were then run by members of their own fleet, presumably due to lack of funds for charters. 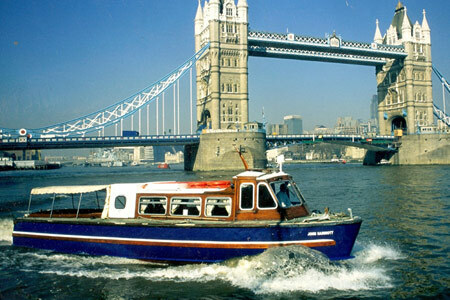 The first of the new cats was Conrad Chelsea Harbour arrived late 1991 from FBM Marine in Cowes. 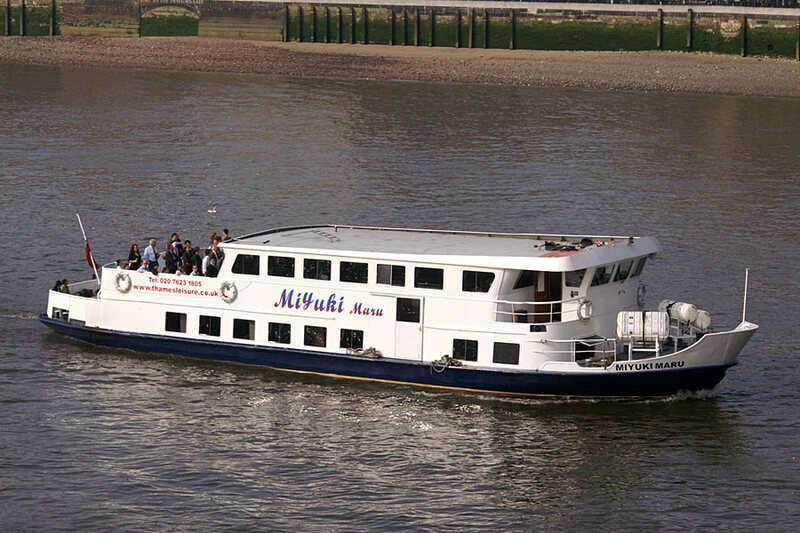 Three 15m executive water taxis were also acquired from FBM's associate company Mustang. These were named Canary Wharf I, II and Ogilvy & Mather. Conrad Chelsea Harbour entered service around 9th March 1992 and was given the number 9 since this was no longer used on The King. 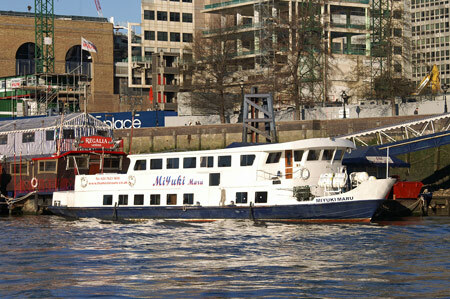 P&O were listed as the owners of 9 Conrad Chelsea Harbour on her registration documents. 10 Veritatem was the next to be delivered on April 24th, and had entered service by May 22nd. Weekend services were resumed on April 11th 1992, continuing through the summer until October 4th. The financial problems of owners Olympia & York were a major concern, although the publicity surrounding them increased RiverBus passengers in the short term. Olympia & York filed for bankruptcy in May 1992, and it was initially expected that RiverBus would cease services on June 30th. 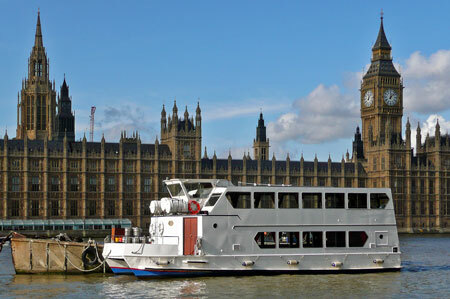 White Horse Ferries emerged as potential bidders for the service, although they intended to use a fleet of 12-passenger water taxis in off peak periods, linking into a service of larger cats which would run right through to Tilbury/Gravesend. 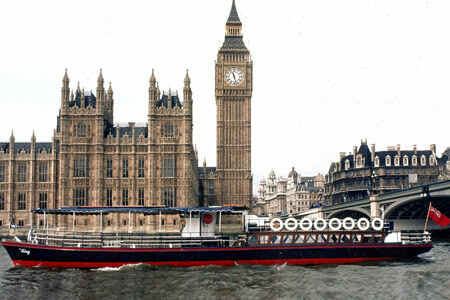 Their bid was rejected, and they formed a subsidiary Thames fast ferries to run their fleet of small cats, the first of which Ebenezer Scrooge was delivered on 17th December 1992. 26 such boats were ordered from Griffon Shipyard, Southampton. 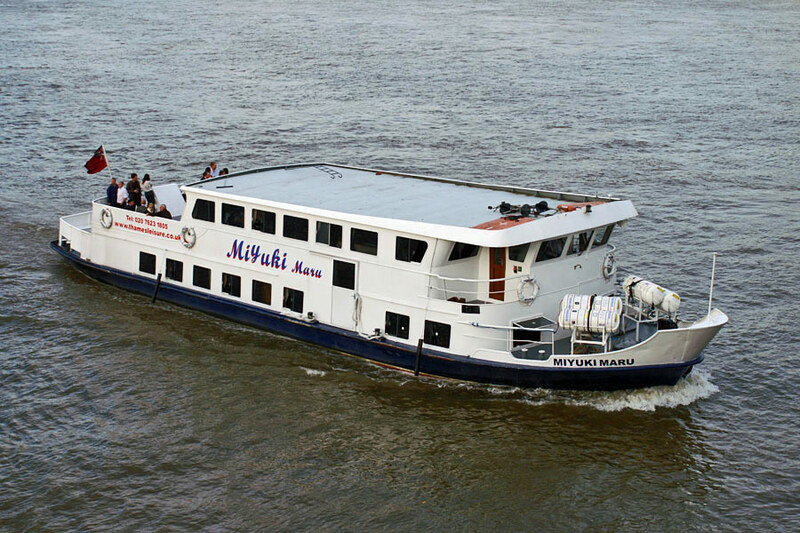 Their services were to be augmented by 2/3 120-seater vessels running down to Tilbury/Gravesend from Docklands. The third new cat 11 DHL Worldwide Express, was initially retained by her builders FBM Marine who sought new buyers in Holland. She was eventually delivered and was laid up with the rest of the fleet when the company ceased operations. RiverBus expected to carry 800,000 passengers in 1992 (later revised to 750,000), twice the number carried in 1991. Services were reduced again in 1993 to a basic 30 minute core service between Chelsea Harbour and Greenwich, with additional peak period Charing Cross-Greenwich runs. Calls at Greenland Pier resumed - these had ceased in 1990. Whilst the company's financial problems were severe, there were still hopes of finding further backing. It was announced on 30th June 1993 that this would come from a Hong Kong bank, securing services for a further six months. It than came as a surprise when it was announced on 20th August 1993 that the company would cease trading that evening. 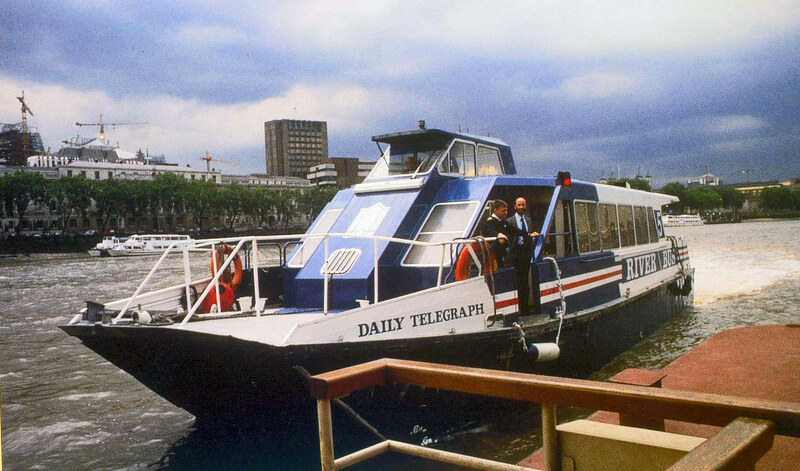 The first boat delivered was Daily Telegraph in 1987, built by Aluminium Shipbuilders of Portchester. She was listed as being 54ft long. Seven further boats were delivered in 1988, listed as 57ft long. all carried 62 passengers. These were also built by Aluminium Shipbuilders of Portchester, but fitted out by British Hovercraft at St Helens, Isle of Wight. Three additional boats of 82ft arrived in 1992 from FBM Marine of Cowes, Isle of Wight. Mercedes was chartered from Westminster Party Boats by RiverBus in the early 1990s whilst they awaited delivery of their new catamarans. She was allocated the number 14 in the RiverBus fleet. 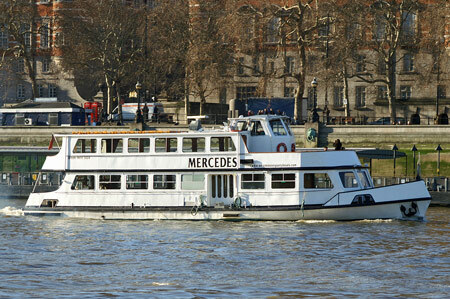 Mercedes had been acquired by Westminster Party Boats for Thames service in 1989 as the Lady Phymar, soon receiving her current name. She had previously been the Koningplaats in the Netherlands. Initially used on charters only, she later operated Westminster-Thames Barrier cruises. 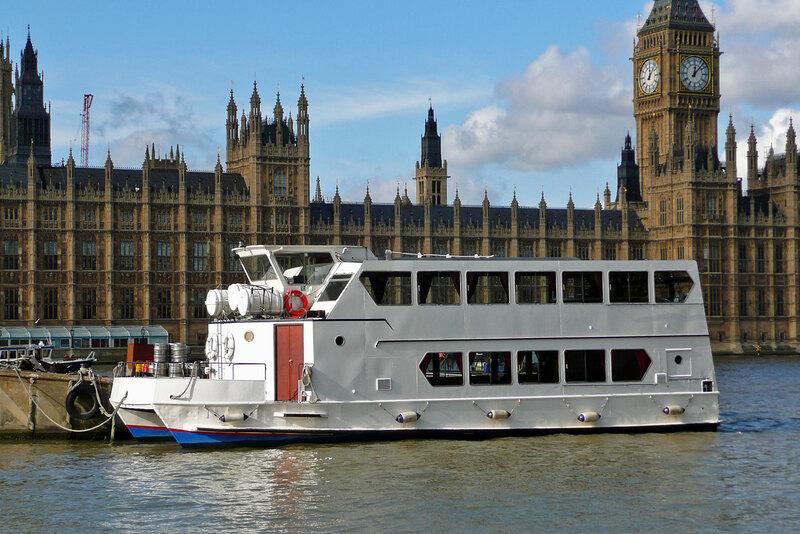 As Westminster Party Boats expanded their fleet (in cooperation with Crown River Services) she served regularly on Westminster-Tower shuttle services. In 2009 these were now largely the preserve of the purpose-built Sapele and Mercuria, but Mercedes still sees service in winter and at busy periods, in addition to her charter work. 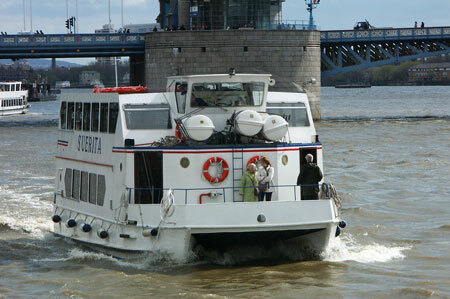 Suerita was chartered from Crown River Services by RiverBus in the early 1990s whilst they awaited delivery of their new catamarans. She was allocated the number 16 in the RiverBus fleet. Suerita was built as the first boat in the Catamaran Cruisers fleet in 1968. She was initially used on the Westminster-Hampton Court route, but her height gave problems passing under bridges at high tide. 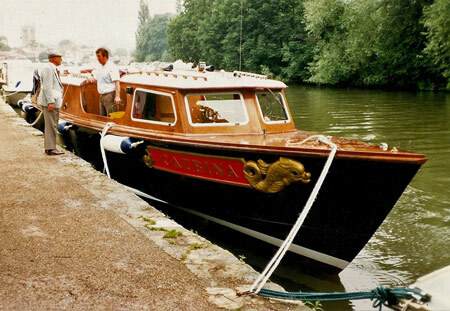 She was then used as a party boat, being joined by Valulla in 1973. Suerita was working for Crown River Cruises by 1991. 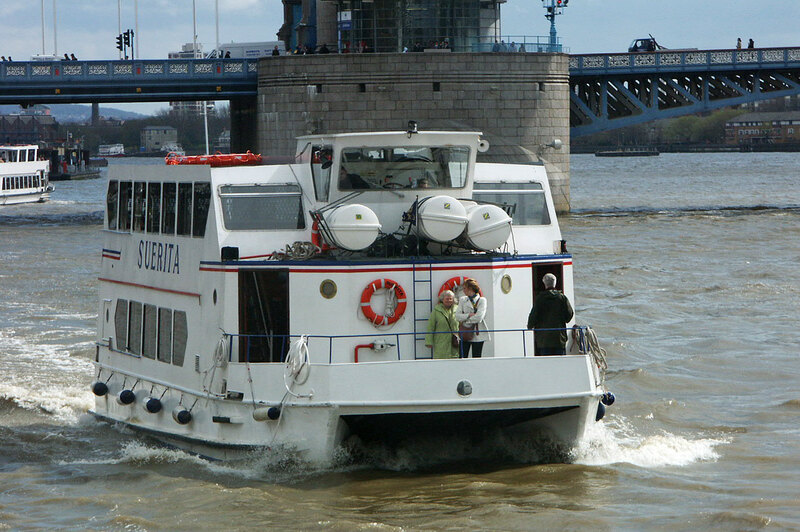 In February 2007 Suerita passed to newly formed London River Cruises and continued on Thames charter work.